4 nozzles included. 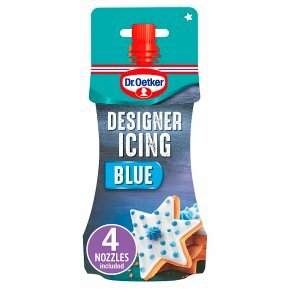 Take your cakes, biscuits and buns to the next level with our Dr. Oetker Designer Icing. Easily decorate and add personalised messages to any of your bakes. The designer icing is simple to use and comes with 4 nozzles that easily attach to the top - skipping out the mess and fuss of a typical piping bag, making it perfect for cupcakes and kids baking on a rainy weekend. For best results knead pouch well before use. Can also be placed in a bowl of warm water for 1 minute to soften. Remove cap and attach nozzle to pouch. Gently squeeze icing pouch applying even pressure. To avoid excess air, push icing down pouch as you pipe. After use wash nozzle, wipe end of pouch and replace cap securely. Decorated items may be refrigerated but Do Not Refrigerate Pouch. Writing Nozzle Use this nozzle for writing, dots, stems, fine lines and borders. For thicker lines the tube can be used without a nozzle. Ribbon Nozzle Use for fancy borders, edging and leaves. Star Nozzle Use for simple flowers, stars and decorative borders. Petal Nozzle Use for borders and petal decorations. WARNING<br>Not suitable for children under 36 months - choking hazard.